WASHINGTON -- The US special envoy for North Korea will visit South Korea this week to coordinate the allies' push to dismantle Pyongyang's nuclear weapons program, the US State Department said Tuesday. 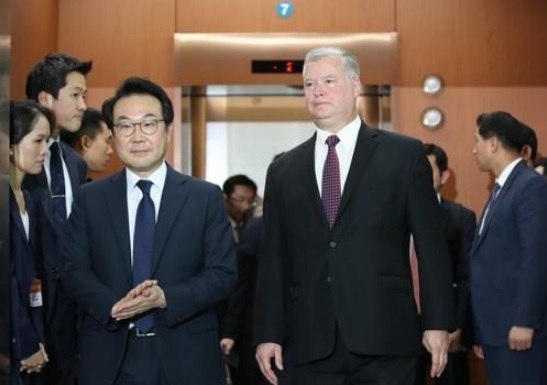 The two sides aim to "further strengthen US-ROK coordination on our shared objective of the final, fully verified denuclearization" of North Korea, it said, using the acronym for South Korea's formal name, the Republic of Korea. The meeting will discuss the allies' joint efforts to achieve denuclearization, "including through inter-Korean cooperation projects," the department said, in a rare recognition of Seoul's stated policy to incentivize Pyongyang to abandon its nuclear program through reconciliation projects.